Bernadette Längle, Centre for Internet and Society and Chaos Computer Club, delivered a talk at Sarai on the Chaos Computer Club and Digital Activism in Europe, on Monday, July 8, 2013. 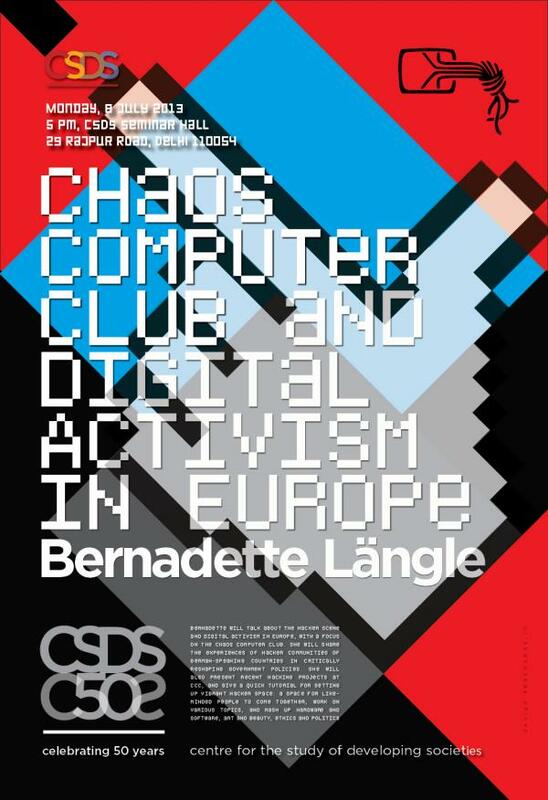 Bernadette spoke about the hacker scene and digital activism in Europe, with a focus on the Chaos Computer Club, and shared the experiences of hacker communities of German-speaking countries in critically reshaping government policies. She also presented recent hacking projects at CCC, and gave a quick tutorial for setting up vibrant hacker space: a space for like-minded people to come together, work on various topics, and mash up hardware and software, art and beauty, ethics and politics. Bernadette Längle holds a degree in social and cultural anthropology, philosophy and computer science and is a policy associate at the Centre for Internet and Society, based in Bangalore. She is also a so-called hacktivist as an active member of one of the oldest hacker associations in the world, the Chaos Computer Club, as well as a member of the CryptoParty movement. Monday, July 8, 2013, at 5 pm. The Sarai Programme, Centre for the Study of Developing Societies, #29 Rajpur Road, Civil Lines, New Delhi. Nearest Metro Station is Civil Lines. The audio files are hosted by the Internet Archive.